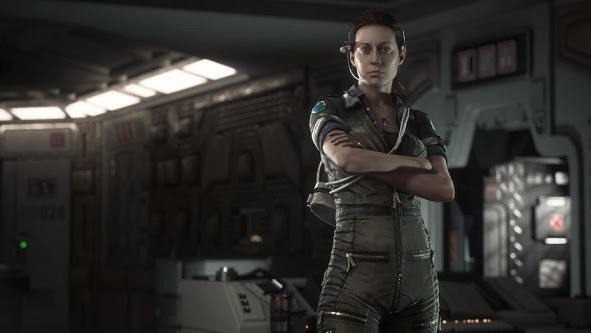 Sega has officially released the trailer for Creative Assembly's Alien: Isolation, and it looks good. Really good, in fact. The trailer definitely evokes the feelings of isolation and horror hearkening back to Ridley Scott's original Alien film. Inspiration drawn straight out of it. Darkened hallways, moving shadows, and a dangerous predator hunting you on a space station. The atmosphere of fear is pervading. Seeing what has become of your crewmates doesn't help, and being unarmed will necessitate a lot of hiding and planning to escape this foe. This looks to be a real return to survival horror many Aliens fans have been waiting for- a deadly and ominous game of hide-and-seek. Isolation takes place 15 years after Alien, on a large, decommissioned trading station called Sevastopol where someone has recovered a Nostromo flight recording. As Weyland-Yutani engineer Amanda Ripley (pictured above), seeking to know what happened to the Nostromo, sets out to find the ship's Black Box. She's trying to find answers to how her mother disappeared. I am very curious how well this story fits in the Alien franchise. As it is, this game looks much better than Colonial Marines. "The thing we're always focused on is that first film," Lead Game Designer Gary Napper told Joystiq at a recent press event. "It's making the game as much like that original experience of being focused on a single alien in a single environment, and not being prepared to shoot it. It's that really close-up, personal, and connected experience with the Alien. That's what we've always focused on and wanted to do." "We wanted you guys to see the Alien in its raw form," Napper explained, "Because we've built this entire game around that set of core mechanics, that kind of base behavior of the Alien, hunting and searching for you and you having nothing to defend yourself." I, for one, am quite eager to experience the terror and desperation this game looks to provide in a first ever "real" Alien experience. Alien: Isolation will be released in late 2014 for PS3, PS4, Xbox One, Xbox 360, and PC.